Red Bull's development curve has always been rapid and with the team struggling at the start of the season they developed their car rapidly. 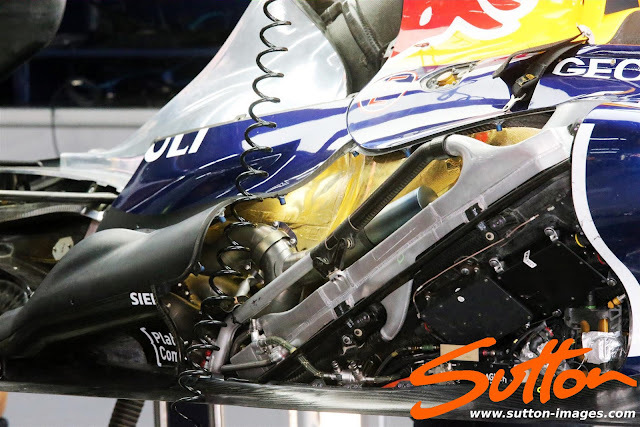 Valencia proved to be a landmark in resolving their issues with the Exhaust Ramp/Cross-Under Tunnel configuration and had it not been for the Safety Car period and ensuing Alternator failure for Sebastian Vettel it would have laid the scene for a landslide victory. Since then the other teams development paths have yo-yo'd the results but Sebastian remained resolute with only Monza as the blip in an otherwise great string of results. With the 2012 season drawing to a conclusion and Ferrari faltering in their application of upgrades Sebastian once again leads the Drivers Championship & Red Bull the Constructors. This is in part due to the fantastic job done in Milton Keynes with solid performance upgrades giving the team the best opportunity to flourish. 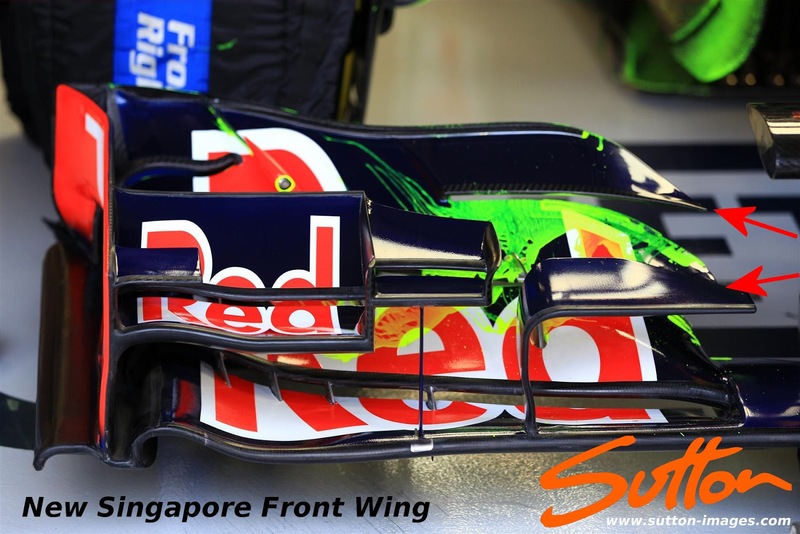 For Singapore Red Bull flew out a new Nosecone/Front Wing which represents a change in philosophy, the Top Flap now separates into two sections making the Wing 4 tiers as opposed to 3. The tips of the Top Flap in combination with the R Cascade in front of it are designed to vorticise the airflow leading to a more energised flow being dispatched along the car. The 'Pelican' nose augments the airflow in a region that is essential this year as with EBD gone getting airflow under and over the floor in the correct way makes a big difference. 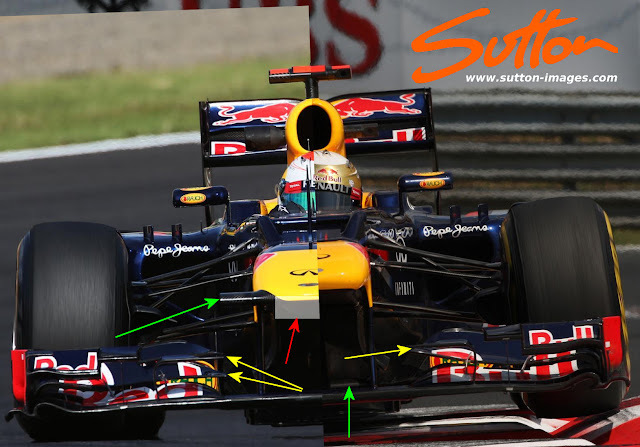 As we know this is the primary reason for the 'Step' noses in 2012 as the teams try to drive as much air under the car to the floor as possible. 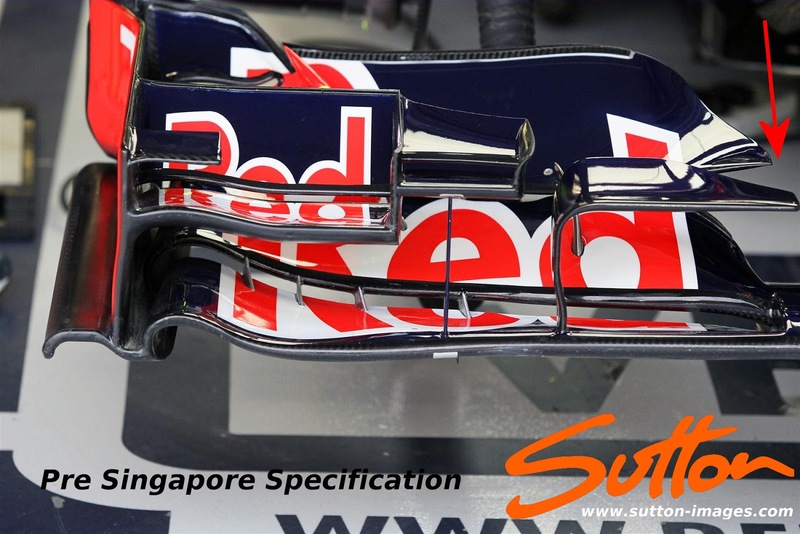 For Korea the team made revisions to their exhaust package and bodywork in order to further utilise their ramp and tunnel combo. Internally the team went back to an exhaust featuring a resonator chamber and visually it would appear that the size of the resonator chamber has been increased. 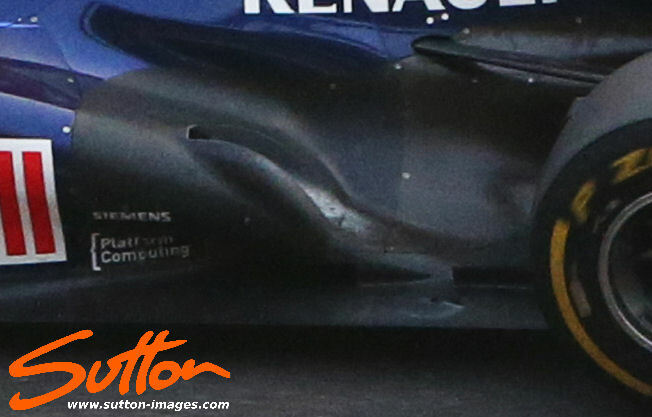 This is coupled by the shortening of the Exhaust ramp and re-profiling of the Cross-Under Channels. Sebastian trialled the new configuration on Friday along with Mark but switched to the usual lengthened style claiming the balance wasn't right. 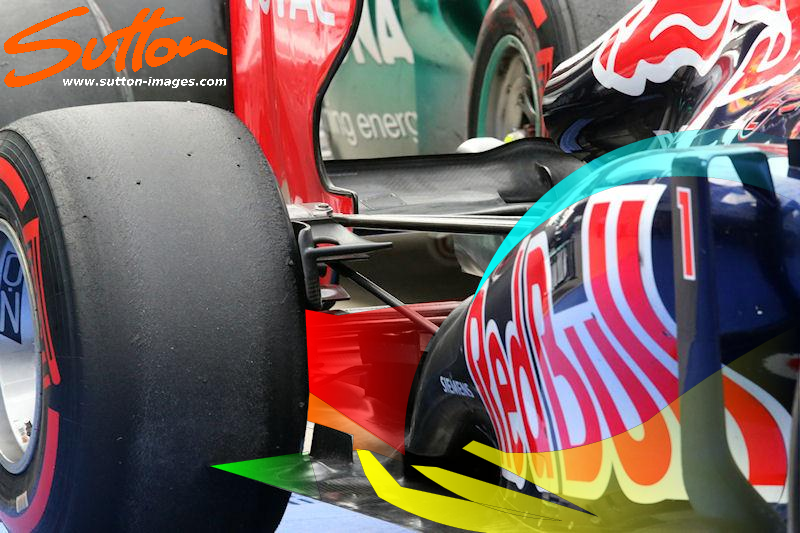 However both drivers ran the new configuration for qualifying and the race. These new bodywork changes were also met with engine cover re-sculpting and rear suspension alterations to further take advantage of the additional downforce being created. The new Exhaust Ramp shortens the Sidepod by around 6 inches in profile and now has the ramp finish ahead of the rear wheel Vertical Floor Strake instead of alongside it. This allows for more 'Coanda' style manipulation of the airflow coming around the Sidepod, aiding in turning the airflow into the Tunnels and any errant airflow converging into the exhaust plume more elegantly. Above: As an idea of how the airflow is being affected by these Sidepod revisions I've done a very basic overlay. 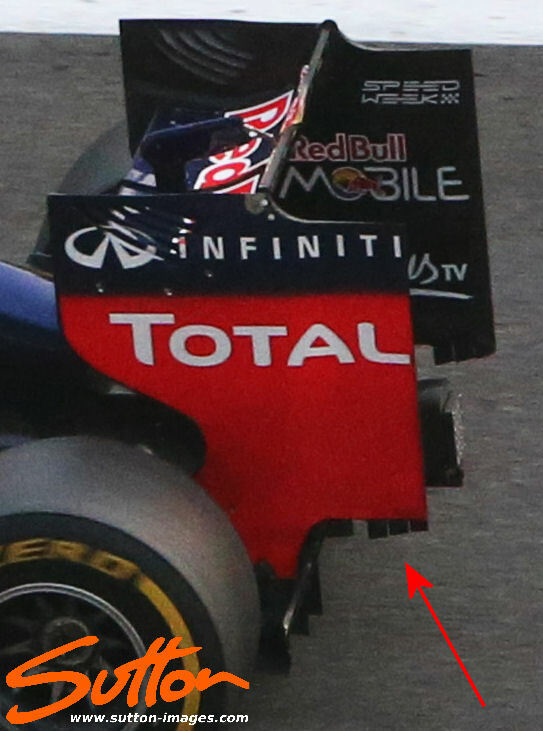 Light Blue is the downwash which is attracted by the exhaust plume and converges with it (marked in red) With the Sidepod now running short of the Vertical Floor Strake it allows some of the airflow that doesn't enter the tunnels to be attracted around into the exhaust plume (marked orange) This cleans up the airflow in front of the tyre (marked Green) reducing the amount of 'Tyre Squirt' that would normally impinge on the diffuser. Mentioned in the RW-DDRS article above but perhaps worth noting here alongside the other developments is Red Bull's reduction of their Rear Wing Endplate Strakes (Above). 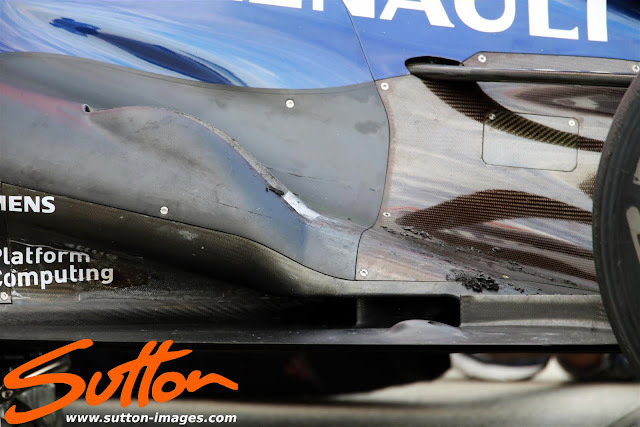 These Strakes help not only guide the airflow aft of the car but also help to manipulate the flow ahead of them so their reduction in length indicates how much more airflow is now being exited centrally. Absolutely your best article yet .. there is so much here it may take me a day or so to soak it all in. This is exactly my interest .. seeing the seasonal evolution of aero strategies. Magnificent work! I've always had a hard time follow F1 technical changes. One read of your article, and I get it! I'm following this site from now on. Thank you for your technical explanations. It enhances my enjoyment of the sport as an arm chair fan. Will follow your blogs closely and recommend it to my friends.